The Singapore Manufacturing Federation (SMF), together with Fidinam Singapore Pte. 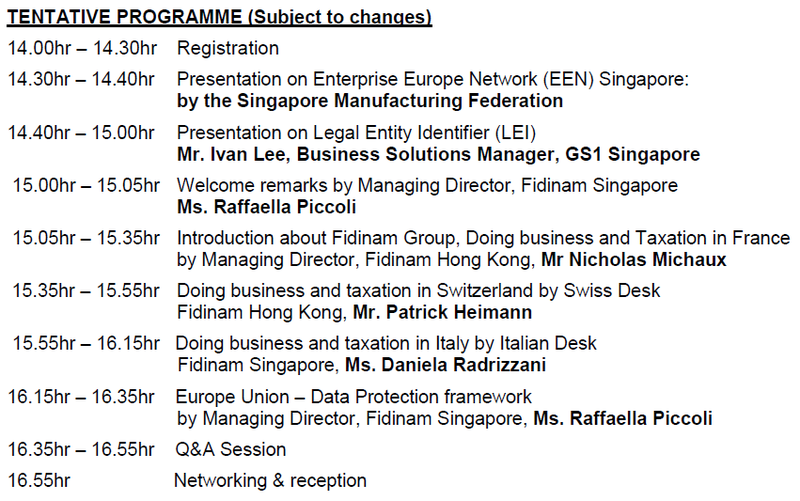 Limited will be organizing a seminar on taxation in France, Italy, Switzerland and EU General Data Protection Regulation (GDPR) on Wednesday 17th Apr 2019, 2.30pm at SMF level 2 auditorium. Experts specializing in taxation in the three European countries as well as the European Union General Data Protection Regulation (GDPR) will be on hand to give presentations and answer questions on European taxation and GDPR matters. Please fax/email registration form to SMF by 16th Apr (Tuesday) 2019. Registration is on first-come-first serve basis. Programme is tentative and is subject to change at the sole discretion of the organizer. Confirmation of your registration will be emailed to your company upon receipt of registration form.